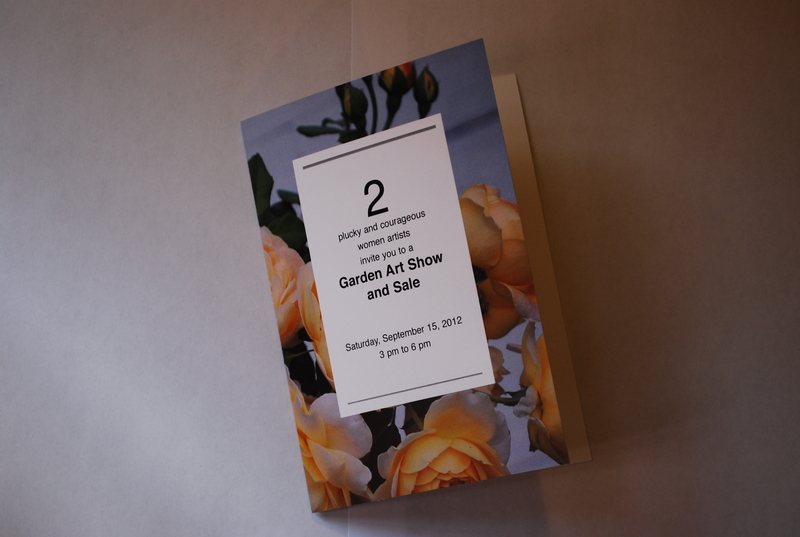 Garden Art Show and Sale, September 15, 2012. 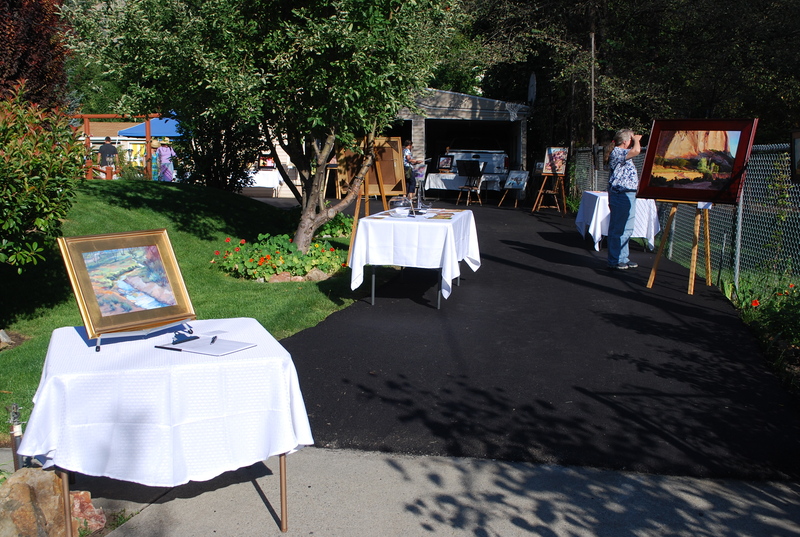 The view, walking up the driveway to meander through the art show in the beautiful backyard. Left to right: Barb Edwards, Roger Motzkus, Glen Edwards, Jess Humphries. 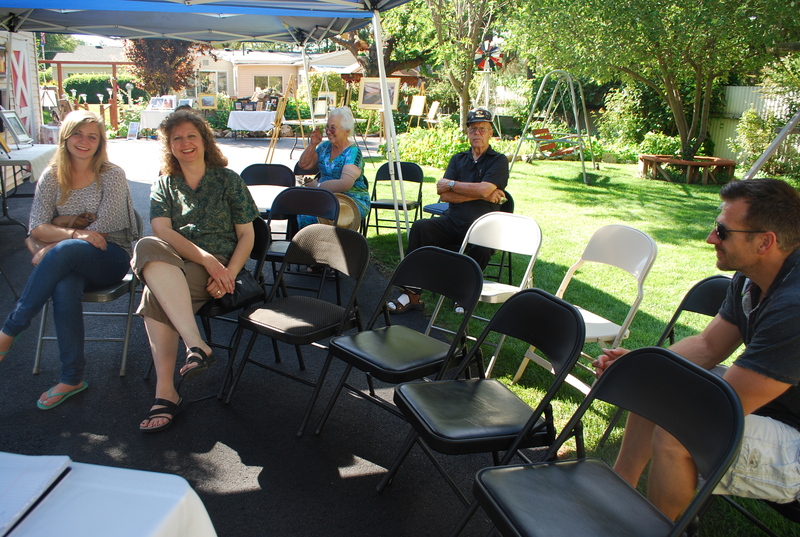 Under the canopy, waiting for the artists to chat: Anna and Susan Lofgren (left), Kay Collett and Jess Humphries (center), and my dear brother, DJ, (right). 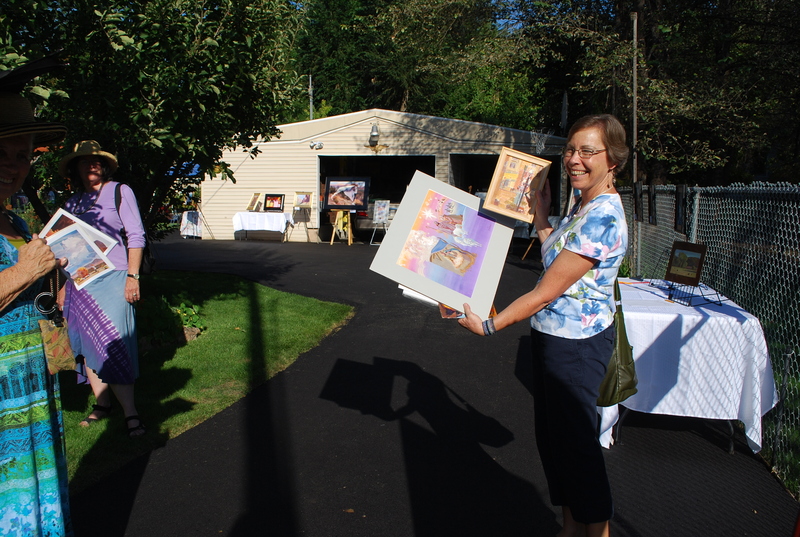 Happy art buyer, Carole Jensen, showing some of her purchases. Dear friend from our days in California. In the ever changing economic landscape, I, an artist who still needs to pay the electric bill, am shifting my art life in the experiment of “staying alive” while joyfully and “boldly going where” I have not gone for a while. I am the proud teacher of 3 enthusiastic and determined students. One is a private lesson on Thursday mornings and the other two are taught jointly on Wednesday mornings. Although I am still doing the occasional illustration job, I have combined forces with my good friend and fellow artist, Roxane Pfister. 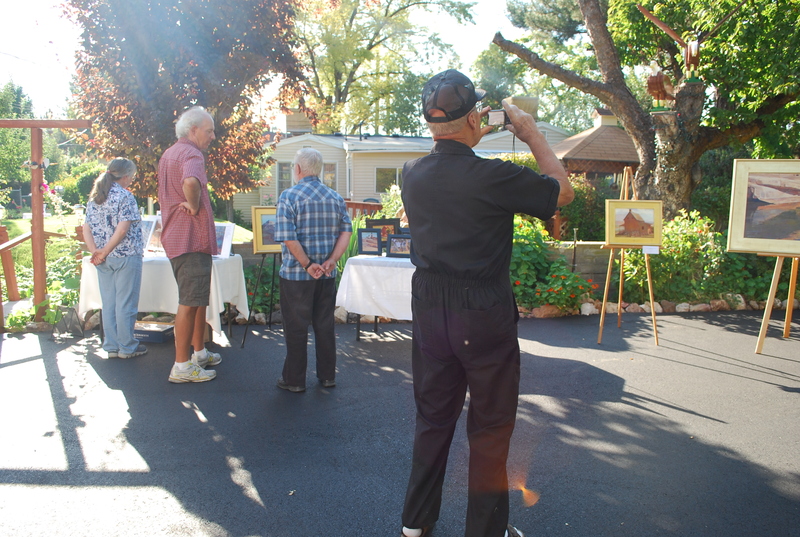 We had the pleasure and work of presenting our art to friends and family on September 15, 2012 in a Garden Art Show and Sale. IT WAS LIKE A GREAT BIG HUG OF ENCOURAGEMENT as Rox and I contemplate going on the road with our art show. The event was held in the beautiful backyard of my parents, Jess and Verna Humphries, in the Holladay area of Salt Lake City. We learned some valuable lessons, like: NOT spending so much money on snail mailed invitations that weren’t as effective as we’d hoped, it takes time and a crew (mom, dad, brother, nephew, niece) to set up-so allow plenty of time, the initial expense of display easels and tablecloths is necessary for start up, and having a wide range of prices (including inexpensive posters and cards) is a good way to go. The weather was great (no wind to knock things around). We had a variety of “events”: silent auction, drawing for 2 free 6×8 oil paintings, artist chat (discover your PRIORITIES, establish a STRUCTURE, and NEVER give up-NEVER surrender), and my mom’s homemade wheat bread along with other light refreshments. 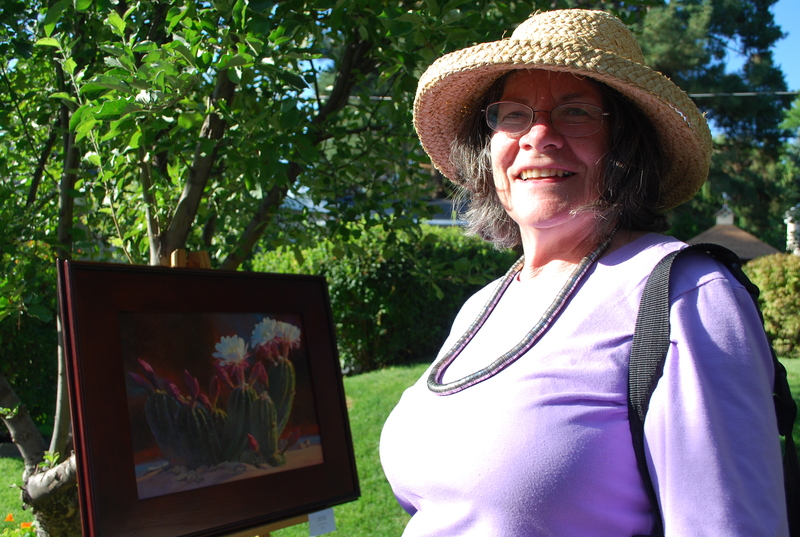 The event, which lasted from 3 to 6pm, was a heartfelt sendoff on the art adventure road by those dear to us. The fancy invitation. Yes, we are plucky and courageous. This entry was posted on September 20, 2012 by dilleenmarshwomanartistrenaissance. It was filed under Open Studio and Home Art Show, Uncategorized and was tagged with art exhibit, art sale, art show, garden art show and sale, oil painting, open studio show, painting. You really put your heart and soul into all of this. I am so inspired by you.